Well-known as a bedding plant but this species has peoved to be quite hardy when left out over winter. Very free-flowering,upright and spreading growth bears pink flowers in profusion in Summer and Autumn. Known as 'Shooting Stars' because of the swept back flower petals. White flowers arise from a green clump of leaves from April. 'Dogs Tooth Violet'. Perennial plant producing large,glossy green leaves and stems of golden-yellow nodding flowers from April to May. Ideal for a woodland position or light shade. 'Dogs Tooth Violet'. Perennial plant having large deep green leaves mottled chocolate brown. Stems of nodding violet-pink flowers are produced in April and May. Ideal for a woodland position or light shade. Perennial Wallflower that has an extremely long flowering period that can extend to almost nine months of the year between April and December. Mauve-purple flowers. An easy-growing but beautifully architectural plant. The long,glossy green leaves usually remain on the plant during winter. The heads of cream/yellow flowers are honey scented and very attractive to Bees. Not the hardiest of herbaceous plants but invaluable for its tall spikes of white flowers continuously through summer and autumn. 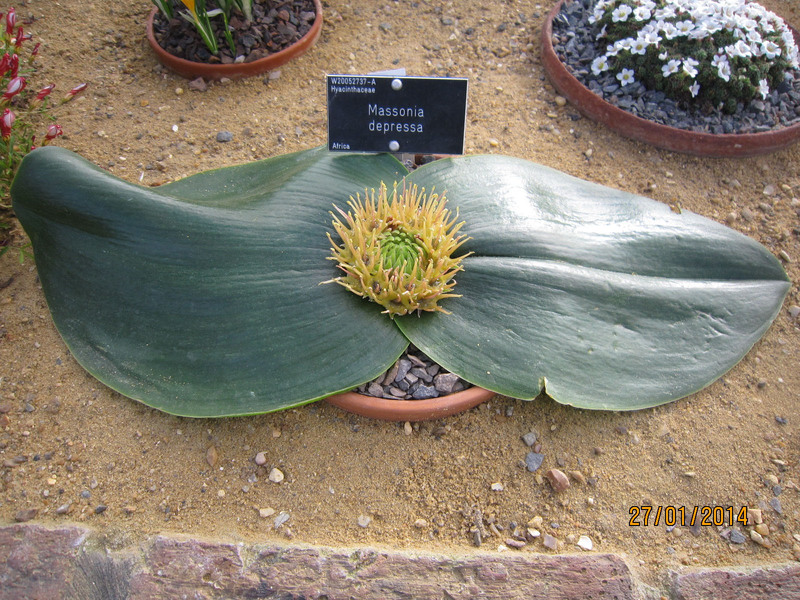 Alpine plant,large,glossy green fleshy leaves with a central boss of white flower borne from late autumn to late winter,although quite frost hardy,probably best grown in an alpine house. Differs only slightly in appearance to Massonia depressa in that the leaves are more rounded and the flower colour quite variable from white to almost maroon. Differs from Massonia depressa in that the leaves are covered in variable pustules,flower colour normally white but variable. Bulb for shade-thin spath like flowers have a long 'tongue' and appear over a long period in summer. Height to 20 cms. Attractive aroid for a shady situation,the upright growth gives rise to tall tubular spathes of green to cream and borne from May/June.